Rating: 5.7/10. From 38 votes. Summary: The description, specs, photo, pricing and user ratings for STI’s Duty One 3 pistol. STI‘s Duty One 3 single-stack 1911 pistol is built on a forged steel, standard-width frame with a tactical rail and chambered in 9mm, .40 SW or .45 ACP. STI milled the picatinny rail into the dust cover, and it accepts all industry standard light mounts. the patented STI International trigger system. Options include a hard chrome finish and fixed, two-dot titanium sights. 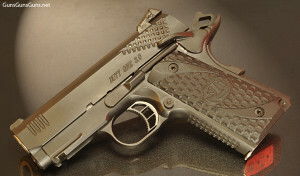 Note: STI also offers an aluminum-framed version of this gun, the Duty One Lt 3.0. 9mm 8+1 3.24″ 6.5″ n/a 31.6 oz. .40 SW 7+1 3.24″ 6.5″ n/a 31.6 oz. .45 ACP 6+1 3.24″ 6.5″ n/a 31.6 oz. This entry was posted in .40 SW, .45 ACP, $1,251-$1,500, 1911, 9mm, Compact, Semiauto, STI International on January 19, 2013 by Staff.